Status as the front-runner and favorite for the Big 12 title. And it would mean even more than that for Texas. After years of struggles, the Longhorns are seeking validation in their quest to regain their traditional role as league heavyweight. 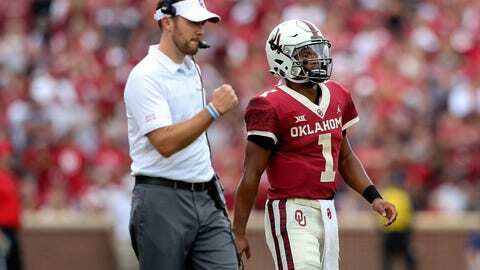 Oklahoma QB Kyler Murray can boost his Heisman credentials with a win. Murray against Texas’ rush ends Charles Omenihu and Breckyn Hager. The Longhorns duo has been late to get revved up this season but they’re starting to get to opposing quarterbacks. Even if they can’t sack him, keeping Murray’s scrambles contained and forcing him toward Longhorns linebackers will be key to slowing down the Sooners. Omenihu had two sacks and a safety last week against Kansas State. Texas: CB Kris Boyd. Boyd has some huge pass breakups, but he’s also been a constant target as he’s shown himself to be vulnerable to double moves and pump fakes. Oklahoma will try to expose that with deep routes to fast receivers Marquise Brown and CeeDee Lamb, who have combined for 10 touchdown receptions. Oklahoma: LB Kenneth Murray. Murray had a Sooners-record 28 tackles against Army and followed it with 17 against Baylor. He must be ready to spy Texas bullish QB Sam Ehlinger‘s run game. Ehlinger hasn’t carried much this season but has been very effective on third down to keep drives going. This is the first time both teams have been ranked since 2012 … Texas coach Tom Herman is looking to avoid being the first Longhorns coach to start 0-2 against Oklahoma since David McWilliams in 1987-88. Lincoln Riley is trying to become the first Sooners coach to win his first two games against Texas since Barry Switzer in 1973-74 … Texas freshman D’Shawn Jamison has two punt returns for Texas. One went for 90 yards and a touchdown.